The Cultural Alliance is a co-sponsor of Create The Vote CT, a nonpartisan public education campaign to raise awareness and support for the arts among voters and candidates running for public office. Elections are a great time to talk about the strengths and challenges our state faces. While candidates spend time talking about jobs, the economy, and education, they rarely talk about arts and culture as part of their vision. The Connecticut Arts Alliance and the Connecticut Alliance for Arts Education have launched Create the Vote CT to put the arts and culture on the agenda. What You Can Do: 1. Join the mailing list (click here) to receive Create the Vote CT news, information, and updates; 2. Like and follow CT Arts Alliance on Facebook and on Twitter; 3. Share the news with the hashtag #CreateTheVoteCT! 4. Use your Arts Voice! Ask the candidates questions about arts and culture. Raise your hand, tweet at the candidates, email them, and post questions to their Facebook pages about their positions on arts, culture and creativity. Stay Tuned! Hear a discussion with three of our six Arts & Cultural Empowerment (ACE) award winners in a podcast of our monthly Spotlight on Arts & Culture interview show. Hear how Dennis Bradbury (Citizen), Megan Bonneau McCool (Artist) and Jim Royle (Educator) got started and what drives them forward in their dynamic impact on their communities. Click here. SAVORCITY, a monthly tour of Bridgeport restaurants, food, art, and music, showcasing the culinary and cultural delights of Connecticut’s most diverse city, launched at Ruuthai's Kitchen in the West End to great applause (see Facebook images and video). The next stop on the tour is May 23, 6-9pm at Bereket Turkish Cuisine, serving “The most delicious Turkish I've ever had! Homemade, so flavorful and plentiful." Paintings by Susan Taylor Murray will be displayed. Musicians to be announced. BYOB! Reserve your seat here! Heidi Lewis Coleman, Rosa Colon, Carol Dixon and Judy Peknik all have work in the Memory of Stories, exhibit, organized by the Stamford Art Association for The Ferguson Library. The show presents images evoking memories of stories the artists read a while ago, and coordinates with a Library program of recording oral histories. At right, Judy Peknik’s Midtown Mood. The show is at the Ferguson Library through Sept. 6, 2018. Nina Bentley, Lucienne Buckner, Louise Cadoux, Linn Cassetta, Rebeca Fuchs, Scott Glaser, Mary Ellen Hendricks, Joanie Landau, Emily Laux, Katya Lebrija, Sooo-z Mastropietro, Cynthia Mullins, Julie O'Connor, Jay Petrow, Barbara Ringer, Guy Sealey, Lee Walther, Cynthia Whalen, Tammy Winser are all in The Westport Artists Collective Pop Up exhibition, In the Realm of the Real and the Unreal, opening Fri. May 18, 5-8 pm, at 96 Orange Street, New Haven, in conjunction with an opening at Artspace, New Haven, at 50 Orange Street. Michael Brenneke, Trace Burroughs, Heidi Lewis Coleman, Scott Glaser, Amy Kaplan, Julie Leff, Diane Pollack and Lisa Silberman, are featured in a special pop-up exhibition, Reveries, in the old Tack Room at 153 Post Road East, in downtown Westport, opening reception Thurs. May 24, 6-8pm. It’s a great space, high ceilings, industrial, city feel. As usual, it’s free and there will be wine, music and snacks! 25% of all sales will be donated to Project Return which empowers young women in crisis to rebuild their lives by providing a safe, secure, and structured environment where they learn the skills needed for healthy independent living. Tara Blackwell, Nancy Breakstone, Heidi Lewis Coleman, Eugenie Diserio, Afsie Djabbari-Aslani, Kris Toohey, Al Coyote Weiner and Jarvis Wilcoxare among the artists participating in Art in the Windows in downtown New Canaan, organized by the Carriage Barn Arts Center. The Kick-Off and Artists Reception takes place at Shoes n’ More (121 Elm St), Thurs., May 31, 5-7pm. Ann Chernow was recently filmed by 4th Row Films for a short documentary about women in art for the Westport Arts Center. At right a shot of Ann from the filming. Heidi Lewis Coleman, who has several pieces in the Reveries Pop Up exhibit, and Art in the Windows, is also in a two-person show at the Bruce S. Kershner Gallery (Fairfield Public Library), Organic Matters. The exhibit, which includes weavings by artist Tina Puckett, runs through July 13 and there is an Opening Reception, Sat., May 26, 4:30-6:30pm. At right Heidi's Álfheimr 2 (2017, acrylic and cut paper on canvas, 12" x 12") part of her Dreamscape Series, which reflects an ongoing exploration of imaginary landscapes inspired by the ancient lands of mythology and cultural lore, whether historical, fictional or fantastical. Eugenie Diserio has her Turks Cloud (acrylic on canvas, 24 x 18") in the window of Shoes n’ More, 121 Elm Street, New Canaan, as part of the Art in the Windows festival in downtown New Canaan, organized by the Carriage Barn Arts Center. The Artists' Reception takes place Thurs., May 31, 5-7pm. Eugenie says the work was inspired by a magnificent Caribbean cloud formation that appeared over the water after a tropical storm at sunset in Turks & Caicos. 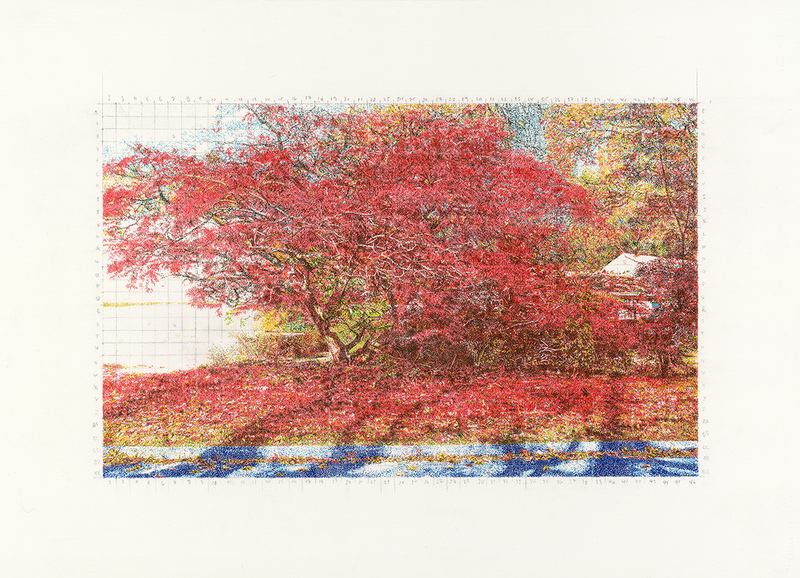 Scott Glaser is getting good response to his new “neo-pointillist” "pointings." His September 21 is a finalist in the 2018 Richeson75 Landscape, Seascape & Architecture Competition and his November 8 (2017, ultrafine felt marker on Arches watercolor paper, 32x40, detail at right, click for complete image) received a merit award in the Richeson 75 competition, won the Buynoski Freehand Drawing Award award in the Greenwich Art Society's 101st Annual Exhibition (2018) and will be seen shortly at the 85th Hudson Valley Art Association's Annual Show. Click on detail for the complete image. Musician and composer Jin Hi Kim was selected as Artist of the Month in the April 2018 Bridgeport Art Trail Newsletter. The Newsletter sets out an interview with Jin-Hi on the eve of the world premiere of her One Sky II for Orchestra, dedicated to the reunification of Korea, and performed at Wesleyan University. In the interview, Jin-Hi cultural, social, spiritual and political action. A large group of musicians are gathering together for a reflection upon the Japanese occupation, the brutal American military force during the Korea War, and the dream of and potential for peace on the Korean peninsula. Read the interview here. Joanie Landau has two of her digital collagraphs on at the Reveries special pop-up exhibition at 153 Post Road East, Westport, opening with a reception Thurs. May 24, 6-8pm. The 2 pieces are: I'm Not Famous (30x40) and Justice and Equality (30x40, detail at right), part of her Signs of the Times series. The show runs through June 3. Sooo-z Mastropietro has several pieces in the Reveries, Pop Up show at 153 Post Road East, Westport, opening with a reception Thurs. May 24, 6-8pm. 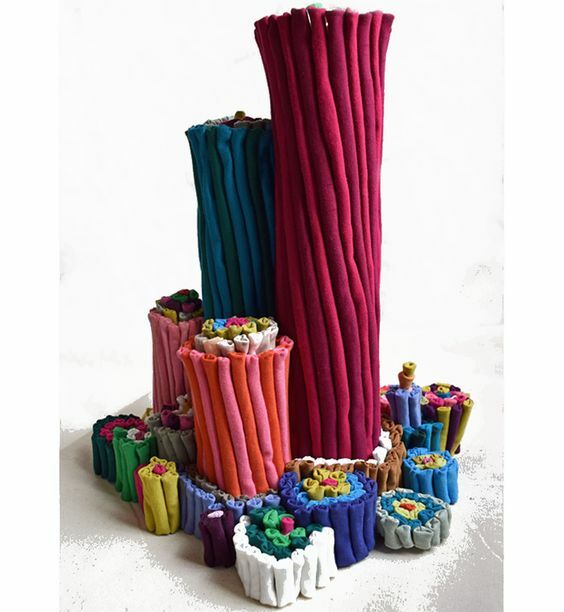 Among her work will be VeKNĺTzia (2015, fabric tubes, 17x17x13, click for larger image) that demonstrates the Murano technique of Venetian glass fabrication in which glass rods are used to create Millefiore patterns. Sooo-z enjoys the opposition of soft versus hard, matte versus shiny, and stretchy versus breakable, with both mediums achieving an ultimate defined perimeter and can be controlled to go beyond their natural inclinations. Rick Shaefer has a selection of paintings, drawings, and limited edition signed prints from now through September at Eleish Van Breems 22 Railroad Place, Westport. At right Untitled (Vertical Tulips), 2018, charcoal, pencil, ink, acrylic on paper, 24" x 24", click for complete image). 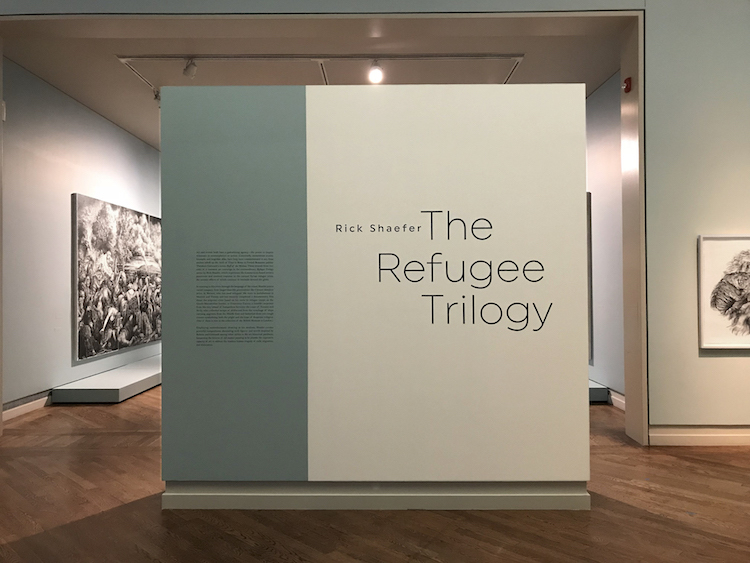 Also see this image from Rick's Refugee Trilogy exhibition, opening Fri. May 18 at Brigham Young University's Art Gallery. Artist member Rene Soto, who is based in Stamford, and is also director of Latincolors Magazine, is starting a new venture: the Rene Soto Gallery at 1 Wall Street, Norwalk. The gallery is opening Sat. May 26 at 6pm, and will be Norwalk’s newest space for established and emerging artists to show and sell their art, whether it be painting, sculpture, poetry, photography, or mixed media art. Exhibitions will highlight artists from outside the US, honoring them with tributes to their country of origin, while providing the public a chance to see art that is not usually accessible.The gallery will also offer educational programs, such as lectures, demonstrations, and workshops. Congratulations Rene! 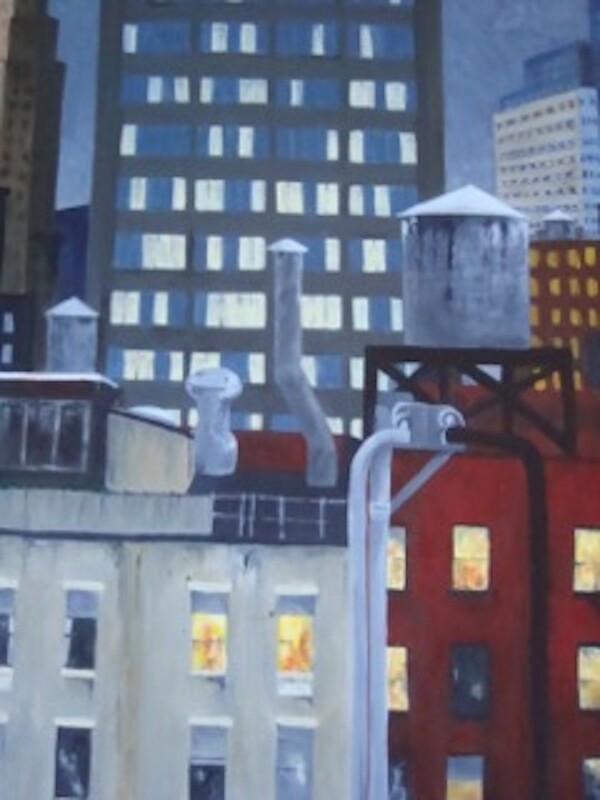 Joan Wheeler will be exhibiting four paintings in Art That Makes The Heart Sing at City Lights Gallery in Bridgeport. Opening reception is May 31, 5:30-8:30pm and the show runs through July 7. It was designed in anticipation of the newest, upcoming City Lights endeavor, Make Music Day-Bpt, scheduled for June 21, offering an eclectic mix of opportunities to make and enjoy music. Joan's painting Le Mal du Pays (at right; click for complete image) is one of the four she is showing and she says it expresses her connection to and deep appreciation of the work of artists Frida Kahlo, Henri Rousseau, and Vincent Van Gogh. 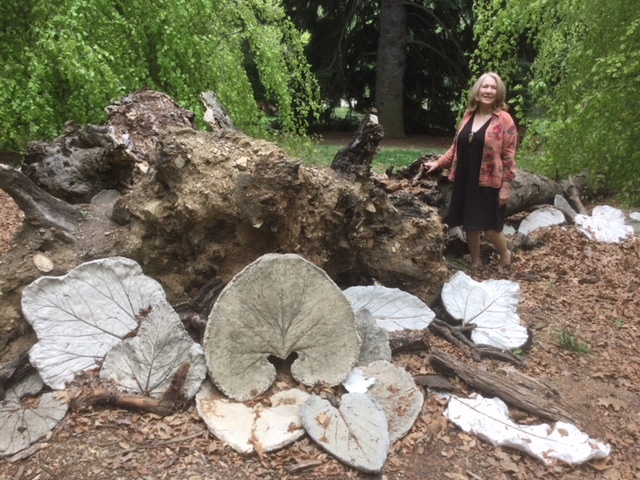 Elizabeth White's Migration installation has moved from the Mattatuck Museum in Waterbury, to Morris Arboretum at the University of Pennsylvania. She is one of 17 artists invited to participate in the "Time in the Garden" exhibition. White's life-cast cement leaves can be seen here through October 28th. At right, one of the leaves in Migration. Click here for an installation image. Sat. 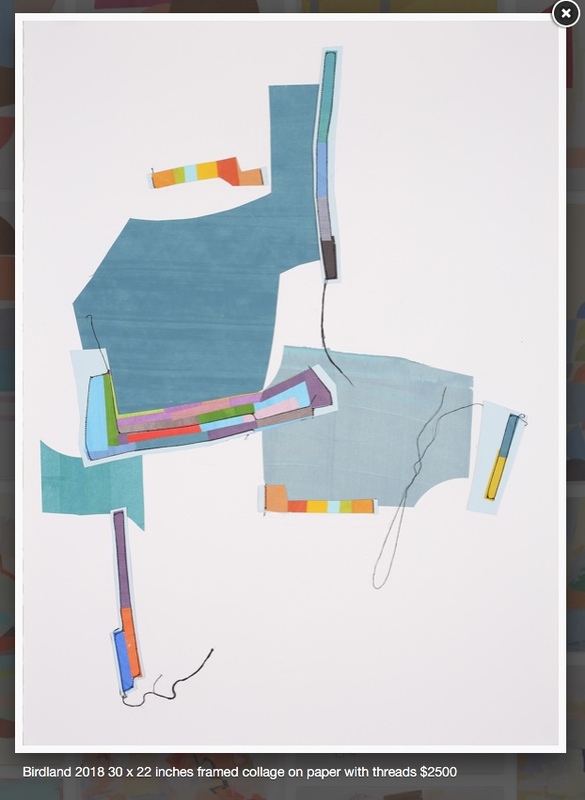 May 26: Rene Soto Gallery, Opening Reception, 1 Wall Street, Norwalk, 4-6pm. Sat. May 26: Heidi Lewis Coleman, Organic Matters. Bruce S. Kershner Gallery. Opening Reception, 4:30-6:30pm. Artists are sought for the fifth annual The Arts Bloom in Weston fund-raiser. The Arts Bloom event will be held on Friday, June 1, from 6 to 9 p.m. at Emmanuel Episcopal Church, 285 Lyons Plain Road, Weston. The event is an art-filled evening showcasing works by local artists in a variety of mediums and designed to benefit artists and local non-profits. There will be live and silent auctions, art-related door prizes, and wine, cheese and other refreshments. The Arts Bloom in Weston committee is seeking original works of Fairfield County professional and amateur artists in the following categories: paintings, ceramics, mixed media, textiles, collages, sculpture, glass, drawing, printmaking, and photography. Student work is also welcome. Artists will receive a minimum price requested for works sold. A portion of the total proceeds from the event will benefit two non-profits, WestonArts and Adams House. Artist entry fees are $25 for the first piece, $15 for subsequent work and include admission to the event. Submission forms are due May 24 and instructions and applications may be found here. Artwork should not exceed 4 feet in any dimension or 100 pounds. Art should be dropped off at Emmanuel’s parish hall May 28-30, between 10am and 3pm. To arrange an alternate drop-off time, call 203-227-8565. Silvermine Arts Center announce a call for entries to the 68th Annual Art of the Northeast. This is an important competition/exhibition highlighting the diversity of work that is currently being made in the Northeast by emerging and established artists. The juror will have at her discretion the ability to select a suite of three to five works by an individual artist. The Best in Show Prize is a solo exhibition at Silvermine Arts Center with a $1,000 stipend for show related expenses. To be considered for the Best in Show Prize, artists are required to enter a minimum of three works. Eligibility: Open to all artists, 17 years of age and older, residing in CT, DE, MA, MD (D.C.), ME, NH, NJ, NY, PA, RI & VT. Original artwork in any media will be accepted. Giclée reproductions of original works will not be accepted. Eligible artwork must have been completed after January 1, 2016, and fall within the restrictions. To enter, complete the Art of the Northeast online application on Slideroom, here. Entry fee is a flat $40 for up to 5 entries. Deadline: Fri. May 25. Please do not include additional information, such as bios, resumes, etc. in your entry submission. The juror for the show is Patricia Hickson, the Emily Hall Tremaine Curator of Contemporary Art at the Wadsworth Atheneum. The 11th Annual Governors Island Art Fair in New York is seeking independent artists worldwide working in all disciplines; Painting, Photography, Sculpture, Installation, Video, and Sound Art. This is New York’s largest independent exhibition. Once selected by 4heads jury, your exhibition space is free. The entire massive event is free to the general public. And as an emerging or established artist, you are free to present your work, your way, at this acclaimed independent art fair in New York City. 4Heads is the New York City nonprofit organization created by artists for artists. The goals of 4heads are to foster community by offering space for artists, to provide arts-education for the underserved, and to expose hidden culture. We support a collaborative DIY spirit while catalyzing dialogue between artists and people from all walks of life. Because 4heads works hard to keep artists’ costs to a bare minimum, gallery scouts, journalists and collectors know that this is where to find the freshest talent, and they come back every year to see what’s been discovered. Many past GIAF artists have launched their art careers here. For instructions and to apply, click here. The Rhode Island Coalition Against Gun Violence (RICAGV) was founded in 2013 after the Sandy Hook Shooting to lobby and educatE around common sense legislative solutions to violence. For this initiative, the RICAGV is proud to support the One Gone Gun project which is working to organize a gun buy back in the state of Rhode Island. In this project, DANGERR: "Designs Aiming for a New #Gunsense Emphasis on Regulations & Reform," RICAGV is looking for bold, affordable works of wearable, useable or decorative art to further an awareness of the gun violence epidemic we still face. We hope to promote conversations that spark debate while providing needed resources to support real action including a planned gun amnesty/buy-back organized by artist Scott Lapham. The competition will also support the RICAGV’s continued advocacy for responsible gun laws. The goal of this competition is to showcase, promote and sell the best designs that may employ an arsenal of wit and skill to transform weapon imagery beyond its deadly intent. The winning entries will be put into production and the top award will receive a purchase order from RICAGV for twenty units at their maximum wholesale cost of $100 (value up to $2,000). For application details and to apply, click here. Downtown Market Stratford! is a juried crafts, art, and jewelry show accompanied by music, activities for children, and theater. It takes place on Sun. Aug. 26, 2018. The show, in it's third year, is sponsored by Stratford’s Economic Development Commission, Stratford Arts Commission, and the Stratford Historical Society. One section of the show will be devoted to 18th Century crafts and art. The 2018 Downtown Market is a juried show, with qualified artists from the Coastal Arts Guild jurying the show. There will be no jury fee this year. Only handmade crafts will be admitted. No mass-produced, imported, kits or non hand-made crafts will be accepted. Based on the artwork submitted, applications will be judged based on the following criteria: creativity and originality of the work; quality of artistic design; overall salability of the art; craftsmanship; price point; and presentation and photos. Submit application and photos by May 31, 2018. Photograph resolution of your craft must be a minimum of 1000 x 1000 pixels, and may be higher. If you are selling more than one kind of craft, a separate application must be sent for each medium. We reserve the right to accept one medium and not another. Further instructions and application form here. The Rowayton Arts Center announces Paint Rowayton, a Plein Air Festival and Competition, May 5-June 8. This is an open call to artists: any artist who paints en plein air may apply. All entries must be original and completed en plein air between May 5 and June 8, 2018 and depict scenes of Rowayton. No photography is allowed. The exhibition of works will be June 10 – June 24 (Portside Gallery). The chairs of this exhibition are: Eunice Roy and Yuko Ike. The juror is Steve DiGiovanni. Paint Rowayton Requirements: Max. Size: 16 x 20. All work must be dry, framed, wired and ready to hang. No saw tooth hangers. Museum edge canvases are acceptable unframed, and must have painted edges and no visible staples. The Chair person may refuse any entry on the grounds of poor condition, oversize or unsuitability. Opening Reception: Sunday, June 10, 4-6pm; in conjunction with the Focus Under Forty exhibition. Pick-up art: Monday, June 25, 4-7pm, or Tuesday, June 26, 11am-2pm. The Artist Fellowship program, run by the CT Office of the Arts, encourages the continuing development of Connecticut artists. The program provides competitive Artistic Excellence grants of $5,000; Artist Fellowship grants of $3,000; and Emerging Recognition grants of $1,000. The funding provides an opportunity for artists to pursue new work and achieve specific creative and career goals. A webinar focused on the FY2019 Arts Fellowship program will take place on Thursday, June 7, 5:30-6:30pm. Register now. The webinar will be recorded, archived and made available later. Eligibility: Connecticut artists in all disciplines may apply, but must be: at least 18 years of age; a citizen, or U.S. permanent legal resident; a full-time resident of Connecticut for a minimum of one year at the time of application; and must remain a CT resident during the grant/funding period and actively working on the creation of new work.Fellowship awards are highly competitive and artists are encouraged to apply only when they have created a substantial body of recent work that can be presented professionally. Applicants must be the primary creator of original works of art. Applicants will be asked to identify their work in one broad category (Visual, Performing, Dramatic Writing, Film, Digital Media, Design, Literature, Traditional Arts and Communnity/Teaching Artist) and up to four (4) general categories. Click here for guidelines. Register for webinar here. The CT Office of the Arts has a recording of its May 8 Grants Information Webinar available here. Remember: Artists can apply for a CT Office of the Art Project Grant ($5-15,000; June 6 deadline) - or Regional Initiative Grant (REGI; $1-4,000, June 20 deadline) - either with a fiscal sponsor (such as NYFA, Fractured Atlas or other 501(c)(3) cultural nonprofit) or through their own legal entity, in partnership with others. Or they may seek to work with a cultural nonprofit (or municipal department, school district, college or university) as part of a project, as every project has to engage at least one Connecticut artist. Discuss project ideas with cultural nonprofits and be one of the artists they work with. Project Grants support "arts-based projects of artistic excellence for Connecticut audiences, communities and participants and that are accessible and relevant to the audience and community it is designed to serve." REGI Grants are designed to encourage and support small community arts-based projects and are perfect for engaging in a specific community matter, reflect on personal experience, and/or projects that bring neighborhoods together. Artist’s Resource Trust was established in 1996 as a fund by Berkshire Taconic Community Foundation to provide support to the creative work of mid-career (aged 35 and older) visual artists who have demonstrated substantial commitment, development and quality in their work. A.R.T. 's focus is on visual artists who live in New England (CT, ME, MA, NH, RI, VT) and in certain towns in NY. Applications for an unrestricted fellowship are invited from individual artists (painters, sculptors, printmakers, photographers and artists using mixed media) who have demonstrated financial need. The fellowships generally range from $1,000 to $10,000 and may support any expense that enhances the artist's ability to create his/her work such as supplies, materials, equipment, rent, travel, residencies, etc. An artist must: Reside in the specified geographic area and have done so for at least two years prior to making the application; have let eight years lapse from receiving a prior ART fellowship; and have an active art practice. Grants awarded generally range from $1,000 to $10,000. They can be applied toward any expense that may enhance the artist’s ability to create his/her work. Awards are counted as income and artists are responsible for all applicable taxes. The primary criterion for the selection of an artist is the excellence of his/her work as evidenced by the images submitted; as well as by demonstrated financial need. You can apply here. Since October 2015, The Studios at MASS MoCA have hosted over 400 artists and writers for residencies up to 10 weeks. Hosted by MASS MoCA’s Assets for Artists program, selected artists receive Residents will receive: A private studio in attractive space on MASS MoCA’s re-purposed mill campus, with generous natural light, 24-hour studio access, plywood floors, a work table and chair in each studio, and shared slop sinks and bathrooms. Housing across the street from the museum, in newly renovated apartments (private bedroom/queen bed + shared kitchen and bath). These are lovely apartments, but note that it’s communal living (4 people to an apartment) in an active downtown location — sensitive sleepers be advised. One communal meal per day, in the company of other artists-in-residence. MASS MoCA member benefits for the duration of the residency, including free access to the museum’s galleries and discounts on performing arts events and museum store purchases. Free access to Makers’ Mill, a printmaking and fiber arts makerspace on Main Street in North Adams (a short walk from the museum), offering shared use of relief press, etching presses, silkscreen and book arts equipment, as well as looms, sewing machines, small tools and work tables. Optional one-on-one artist-focused financial and business coaching through the staff of MASS MoCA’s Assets for Artists program, helping artists and writers in all disciplines strengthen the business side of their artistic practice. The full-price residency fee is $650/week, but many participants receive need-based and merit-based financial aid. There is no application fee. Applications are currently accepted through July 9, 2018, for residency sessions between October 10, 2018 and April 2, 2019. Apply here. The Bedford Playhouse, Bedford, NY, is an historic cinema (1947) that has undergone a two-year, $6 million-dollar renovation to house a new, nonprofit cinema, cultural center, and community hub, due to open in September 2018. The Playhouse should prove to be a destination where Westchester and Connecticut residents gather for film, music, and special events. It is home to the Clive Davis Arts Center, where three theaters, all served by state of the art equipment, will feature the best new movie releases as well as classics and family entertainment, author and speaker events, small musical performances, art exhibits, and educational offerings. A spacious café with a full bar will offer light meals and will be a vibrant gathering place where people can meet for a drink or snack. The Bedford Playhouse now seeks an organized, experienced and dynamic executive, to lead and manage its growth as its first Executive Director (ED). The ED will launch and supervise all aspects of the organization’s operations, programs, fundraising, revenue generation, marketing, and membership. This individual will be charged with the strategic leadership of the organization, operational stability, and membership growth. This ED will establish the organization, market the programmatic offerings, and ensure excellent service to members and the broader community. He or she will be a versatile self-starter with a passion to lead and grow the organization. The Executive Director will exhibit a strong passion for the arts, have demonstrated success in Development, (including annual fund drives and endowment building), and serve as a hands-on manager who strengthens the organization by creating positive relationships among all constituencies. The Executive Director will report directly to the Board and be responsible for the launch, roll-out and management of the day-to-day operations and direction of departmental managers of the Bedford Playhouse - planning, organizing and overseeing all administrative functions of the organization, including: Development (Director of Development); Theater Operations; Marketing; Finance and Accounting; and the Café. Full job description here. Those interested should submit a letter and resume (electronic submissions preferred) with a summary of demonstrable accomplishments to bphsearch@gmail.com. I-Park Foundation, Inc. (I-Park) seeks an energetic Programs and Social Media Manager (PM) to nurture the creative process of exceptional artists accepted into the Residency Program by providing them with the resources and personalized support with which to experience an inspiring, productive, memorable residency. The PM will promote I-Park’s programs, activities, and brand via social media and play a significant role in delivering public events of the highest artistic value. Set within a 450-acre nature preserve, I-Park is an inspirational open-air and closed-studio laboratory for individual creative pursuits in the fields of visual arts, architecture, music composition/sound art, moving image, creative writing, and landscape/garden/ ecological design. I-Park has developed a special interest in site-responsive art and has been the setting for mission-related on-site exhibitions, performances, symposia, and cross-disciplinary projects of cultural significance. To date, an international artists-in-residence program, the organization’s flagship initiative, has sponsored over 900 fully funded month-long residencies. The PM is responsible for advancing I-Park’s mission, values, visibility, and resources by effectively planning, promoting, administering, delivering, and evaluating an international Residency Program that brings out the very best in its artists-in-residence. The PM also publicizes and manages a variety of related public events. A proactive professional, the PM is I-Park’s frontline provider of all aspects of artists’ support. Reporting to the Executive Director, the PM cheerfully and graciously anticipates and meets the needs and expectations of artist residents, curatorial advisors, selection panelists, stakeholders, and existing and prospective audiences; inspires and supervises three direct reports, interns, and volunteers; manages a departmental budget; provides oversight of the physical plant; and stays current with and implements best practices and developments in the field. This is a full-time, 40-hour/week, exempt position. Occasional evenings and weekend hours are required. Qualifications: Minimum two years in a position of responsibility in an arts-based nonprofit or for-profit organization; outstanding writing, speaking, and people skills; experience in digital marketing; etc. Attributes: Sensitive, keen observer and creative problem solver with a high degree of organization, attention to detail, passion for the arts, and an ability to set priorities and work independently in a deadline-driven environment. For full job description, click here. Send résumé and cover letter to career@i-park.org with “Programs Manager” in the subject line. Interested individuals are urged to apply by May 31, 2018. No telephone calls, please.